When the Queensland Health Interpreter Service was established in 2007, a comprehensive plan was developed to evaluate the quality of the service. This plan included surveys of staff, interpreter service coordinators, community stakeholders and clients. In 2012, a review of interpreter service client experiences of the service was completed as a part of this quality assurance process. The survey was conducted via telephone surveys using interpreters, and was administered to a random sample of 332 clients of the service. The National Health Performance Framework’s Health System Performance domains were used to assess service quality. 80 per cent of clients were not concerned about confidentiality of their personal information when using an interpreter (responsiveness). The survey also indicated that improvement is required in responsiveness and safety as well as continuous service delivery. almost one half of clients did not receive an interpreter each time they visited Queensland Health in the past 12 months (continuous) and used a family member or friend to interpret for them at a health appointment in the past 12 months (safety). This occurred regularly in 7 per cent of cases, and sometimes in 42 per cent of cases. The main reasons why clients used family and friends as an interpreter were that interpreters were not booked or did not arrive (64 per cent) and client choice (26 per cent). Qualitative responses to survey questions further identified that the service could be improved by addressing interpreter system issues and interpreter quality issues. Overall, taking both the quantitative and qualitative data into consideration, the Queensland Health Interpreter Service is a quality service, with more than 90 per cent of clients satisfied with the interpreter service. Interpreter system improvements - booking interpreters when required, educating clients about why professional interpreters are required, promoting the service being free of charge, and educating interpreters about the importance of arriving on time. 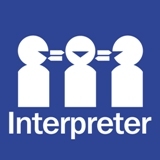 Interpreter quality improvements - accuracy, completeness and impartiality in interpreting, training in medical terminology, treating information confidentially, being respectful during interpreting and staying to interpret for the whole appointment. The one variable that was statistically significantly related to overall client satisfaction, when all other variables were considered, was the client’s willingness to use the same interpreter again. Interpreter quality issues appear to be the most important issue to improve overall client satisfaction with the service. Queensland Health will now work on addressing the interpreter system and interpreter quality issues identified in this research.